Hurricanes threaten people living in the Caribbean and on the eastern seaboard of the United States every year between August and October, the hurricane season. Some years  like last year, in which six large and destructive Atlantic hurricanes hit the coast  are worse than others, causing millions of dollars in damage and losses. Now scientists are proposing a new method for assessing the probability of a "good" or "bad" hurricane season, which could give insurance companies the ability to plan in advance what sort of protection they may need for their clients. Winds in the atmosphere drive storm systems westward toward North America or eastward into the Atlantic Ocean. In work sponsored by the United Kingdom insurance industry and published in today's edition of Nature, Mark Saunders and Adam Lea of the University College London explored whether those so-called steering wind currents were predictable enough to forecast hurricanes. They created a statistical model to determine whether there would be above average or below average hurricane activity during the peak season in North America. 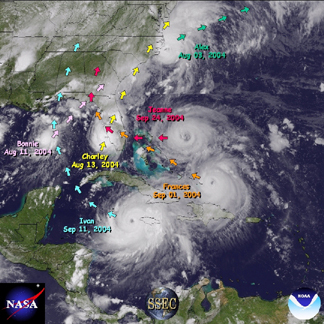 Comparing historical records from 1950 to 2003 to the National Oceanic and Atmospheric Administration's Accumulated Cyclone Energy (ACE) index, a measure of hurricane strength and intensity at sea, the team determined that wind anomalies during July could be linked to hurricane activity later in the year. "Using this index of combined conditions (storm activity and steering conditions) can help provide a predictive picture," says Phil Klotzbach, a research associate at Colorado State University in Fort Collins. "Hurricane forecasting is for individual storms, but this metric is for the whole season." Scientists say that they may be able to predict the amount of activity for a given hurricane season, like the 2004 season, during which six hurricanes and tropical storms affected the east coast of the United States. Each color arrow on this image defines the path of individual storms, driven by steering currents. Image courtesy of Rick Kohrs/UW-SSEC and NASA/SSEC/NOAA. Saunders and Lea found that their model predicted above or below average activity correctly 80 percent of the time between the years 1950 and 2003. On Aug. 4, 2004, Saunders posted his prediction for the 2004 hurricane season on the Web site tropicalstormrisk.com, which suggested a 70 percent chance of an above average season, and only a 10 percent likelihood for a below average season. And, as most Floridians are well-aware, the prediction was correct, with 2004 being an especially active year for hurricanes. However, not everyone agrees that wind anomalies are a useful metric for predicting storms that make landfall. "I think the jury is still out on whether or not we can predict landfall" of a hurricane, says Richard Pasch, a hurricane specialist with the Tropical Prediction Center/National Hurricane Center in Miami, Fla. "Numbers don't mean much, especially to individuals," Pasch says. "If you're in the hurricane belt [Florida, North Carolina, New Jersey, etc.] then you need to have a plan every year. You don't really look at seasonal forecasts." There have been a "variety of techniques for making long-range forecasts," Saunders says, "but with fairly limited success." Some of those techniques include monitoring sea-surface temperatures and pressures, and the number of hurricane days in a given year, rather than correlating the height of wind anomalies to hurricane strength and intensity. Because these other methods do not consider the steering currents, Saunders says, they lack the ability to predict the likelihood of tropical storms making landfall. 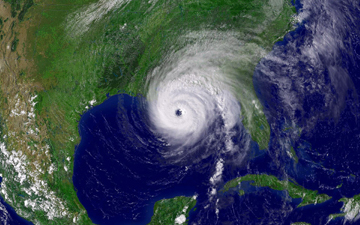 This visible satellite image depicts the rotating clouds of Hurricane Ivan approaching U.S. landfall on Sept. 15, 2004. Image courtesy of NOAA. Although there are several methods to measure the success and the predictions, Pasch says, scientists typically focus on the ability of each individual parameter used to predict above or below normal activity during the season. For instance, William Gray, an atmospheric scientist at Colorado State University, who makes yearly predictions with Klotzbach, uses numbers of named storms, days of hurricane activity, days of intense hurricane activity and other factors from previous years, to make a seasonal forecast for an upcoming year's storms. If the majority of their parameters suggest an above average year, they forecast more hurricanes. Then, after the season has passed, they assess each parameter's ability to make the right prediction and recalibrate the model for the following year. The method, Saunders says, could be useful to insurance agencies, which will be able to speculate on the odds of needing more or less insurance. "The big risk is hurricane damage in North America," Saunders says. To reduce the financial costs incurred, "these companies will find [the model] useful." According to estimates by Klotzbach and Gray, Hurricane Ivan caused $4.5 billion in insured losses and $4.5 billion in other damages. The four largest storms during that year (Charley, Frances, Ivan and Jeanne) caused an insured loss of $22.5 billion and approximately the same amount in other losses, a total of $45 billion in damages. The next step is to see if the seasonal forecast model can be used at a regional scale, says Saunders, to determine if it will be a useful metric for predicting landfall in particular areas, such as the Gulf Coast of Florida. Saunders and Lea would also like to expand the model to test its feasibility for other parts of the world where wind patterns and steering currents are different, such as in areas afflicted by monsoons.